Complete subset of 10 1991-92 Pro Set Platinum hockey celebrity cards (numbered 291 through 300) in two uncut strips of five. 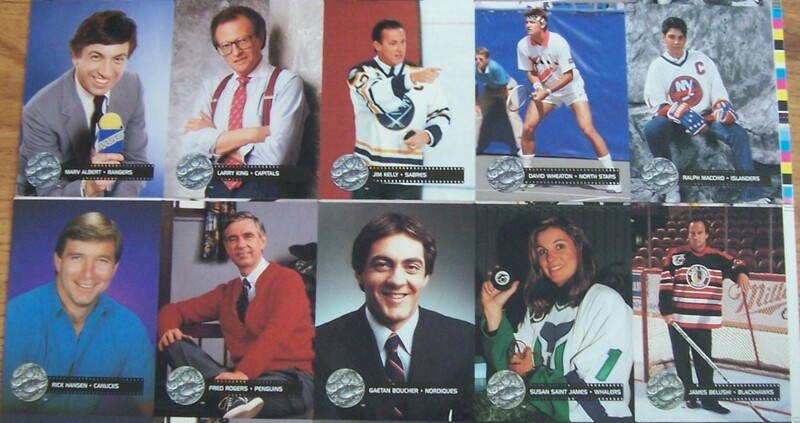 The 10 celebrities are Marv Albert, Larry King, Jim Kelly, David Wheaton, Ralph Macchio, Rick Hansen, Fred (Mr.) Rogers, Gaetan Boucher, Susan Saint James and James Belushi. Both strips have minor corner wear and minor surface creases. ONLY ONE SET LEFT.